The little horn power of the seventh chapter of Daniel is absolutely synonymous with the power of the beast who received a deadly wound which “was healed”. It is more evident that this healing should be evidenced by the fact that “all the world wondered after the beast”. Now, that these powers are the same is abundantly evident. The saints are identified as those who “keep the commandments of God and have the faith of Jesus.” (Rev. 14:12) Therefore, to make war with the saints is to make war with Jesus, who alone can make men saints, it is also a declaration of war on the law of God which the saints uphold. The little horn and beast powers can only refer to the same power: the Papacy. The Papacy, at the termination of her political conquests over the kings of the earth lasted a complete 1260 years, from the time of 538CE to 1798CE. So perfectly described: she made war with the saints; so definitely recorded in history did she make void the law of God, trampling it underfoot. Her mouth commanded itself above the consciences of men, employing force over that which alone God is to have dominion over, and who Himself does not force the will. And so surely this power lost it’s kingly throne just as the mouth of God declared in 1798, but the Scripture also tell us that the deadly wound would be healed, and that must mean an absolute undoing of the thing which the deadly wound consisted of. And of these things, there are many elements we may cite, but the affects of it’s healing would be evident: all the world wonders after the beast. And because Scripture so strikingly tells us that the kings of the earth committed fornication with her, there must be a definitively united confederacy between the Papacy and the governments of the world. 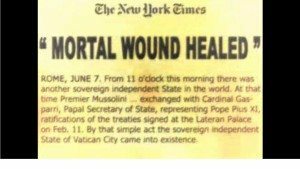 Since the deadly wound lost the political influence and power over the kings of the earth, the healing of the wound would reverse this with the sign of governments awestruck by the Papacy. 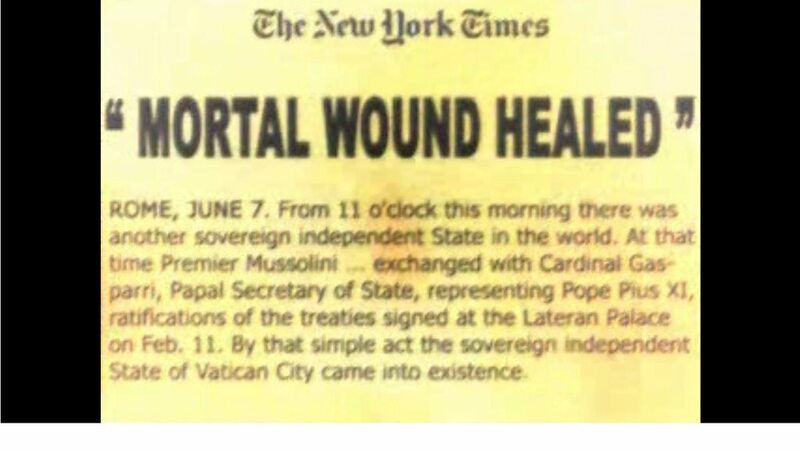 If we would understand something of the Papal healing, we should study it’s rising progression to power also. Daniel 12:11 And from the time that the daily sacrifice shall be taken away, and the abomination that maketh desolate set up, there shall be a thousand two hundred and ninety days. From the time that France converted to Papalism, it now began to gain power over the kingdoms with rapid speed. 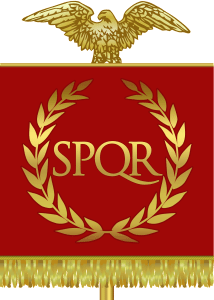 France was the entering in of the Papal power, and from this point forward, influence was gained until 30 years later, the Roman empire was secured. This was the rising of the power of the Papal beast who received it’s deadly wound at the end of the prophetic periods stated above. Now, the deadly wound meant a loss of power. And if we understand the beginning of those prophetic periods upon which that Papal beast received it’s power, we might understand what is required for it to again secure that same power again. Since it only needed influence in one kingdom to eventually have power over the whole Roman empire, even so it only needed the influence of one kingdom to begin healing the deadly wound. The rise to power in the Papacy’s birth was also to be a sign of it’s rise to power again in it’s revival. Such a revival is not insignificant, seeing as the Papacy is so fundamentally laid open in prophecy for being the most cruel and deceptive of the Satanic masterpieces of death and desolation to the whole earth. For such a revival to occur, it can mean nothing less than it’s rise to power, but in fact, it can only mean far worse. But when was such a door to revival to be opened to the Papacy? 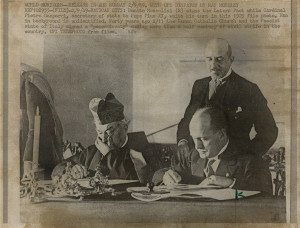 It was in 1929 at the signing of the Lateran Treaty. The Lateran Treaty was a concord agreement between Mussolini and the Catholic church which would grant the Catholic church to become it’s own state power in Italy. This land that was afforded to the church was the Vatican, the place where St. Peter’s Basilica was built through the blasphemous sponsorship program of Papal indulgences which spearheaded the Protestant Reformation to go forward. Yet despite having secured the privileges of being it’s own government, this was not the complete healing of the deadly wound any more than France’s conversion to Catholicism was the fullness of the Papal beast’s power, but it was merely the beginning of it’s healing. But with such a small land, what influence could the Catholic church be? It could be much influence in every way as pertaining to governmental affairs. The Catholic church becoming it’s own state power, it now could hold diplomatic ties to the other nations of the world. No longer did the Catholic church need to represent itself as merely an ecclesiastical authority, but could now have diplomatic relations on a political level with the governments of the world. From the time of 1929 to the present time, the Vatican has more than 175 embassies with Papal nuncios (ambassadors for the Vatican) living on government premises. What does this mean? 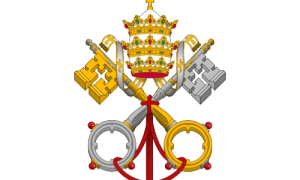 It means that representatives of the Vatican have been planted upon nearly every country in the world to represent the Vatican at a close, intimate level with the particular government wherever the nuncios are present. The purpose of these relations cannot be undermined, for by them, not only does the Pope and his representatives hold close communication with the leaders in government, but wields influences and dialogue over the decisions and the overall shaping the policies and practices of nations on a worldwide scale. 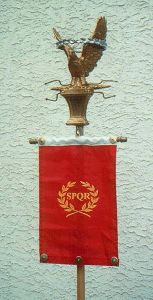 The flag placed by the Roman Armies around Jerusalem at the time of it’s desolation. Since it was an abomination of desolation to the establishment of the Papal government in 508CE and 538CE, the very same thing is to be definitely employed at it’s healing. Likewise, we can draw some similarities to it’s healing from the destruction that was to meet Jerusalem as “the abomination of desolation”. Just as Clovis’ church state was a sign that the Papacy was gaining power, and finds it’s contemporary with the signing of the Lateran Treaty, even so the sign of the abomination of desolation before Jerusalem’s destruction was significant to understanding of a counterpart it holds today, which sign is a definite signal to leave the cities. 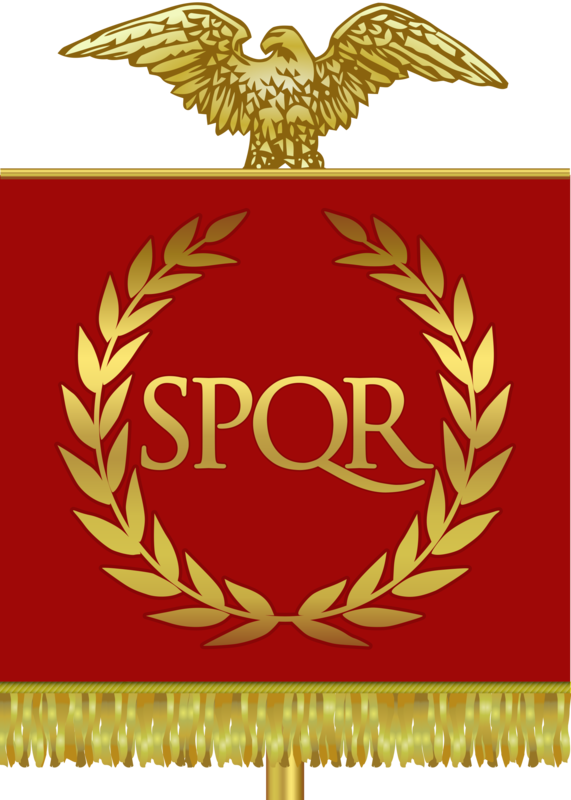 The flag of the Roman Standard was raised upon the grounds of Jerusalem as a signal to God’s people that it was now time to leave the cities. So distinctly was this recognized as what would bring the desolation. The Roman armies planted their conquering sign upon the grounds of Jerusalem, just as the “arms” of the Papacy (that is, the kings of the earth) began to move in against those who opposed the Papal religion. Likewise today, there is a sign worthy of mention which culminates the signing of the diplomatic relations brought in by the Lateran Treaty. The little horn and the diverse beast power are one in the same, and the language that Scripture conveys clearly lays this fact out for us. Therefore the deadly wound that the diverse beast sustains at the end of it’s prophetic period of 1260 years is the same thing which must correspond with the little horn of Daniel 7 at the end of it’s prophetic count. Likewise, as the diverse beast has a healing of that wound, we should not marvel as to see the little horn rise again to great prominence finding that very same healing to it, because it is one and the same power. 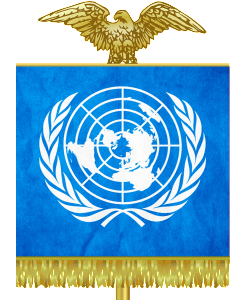 It is interesting to note that the “victor’s crown” lauryl on the Roman Standard flag is the same as that found on the United Nations logo. 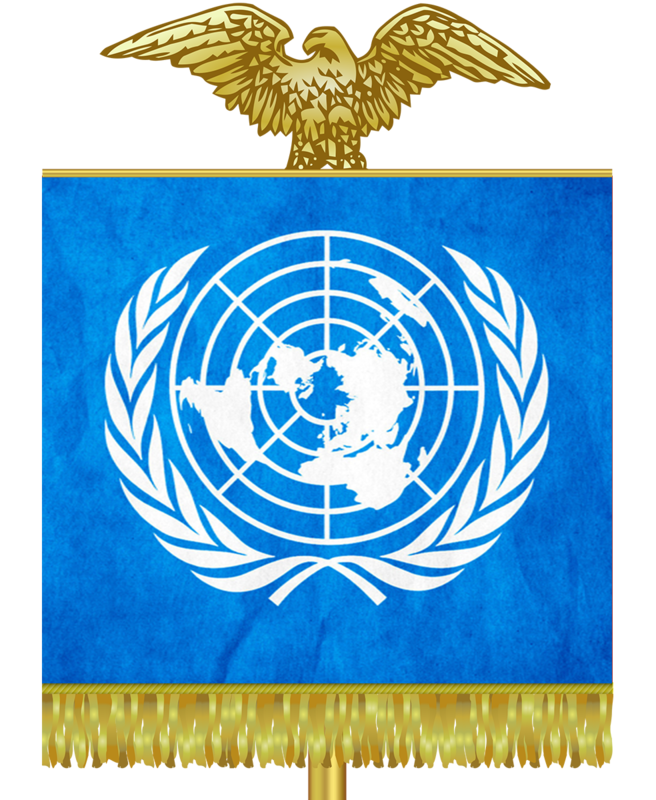 The United Nations is the very organization which has gathered the kings of the earth and the diverse horn has it’s flag raised at.cting the kings of the earth. 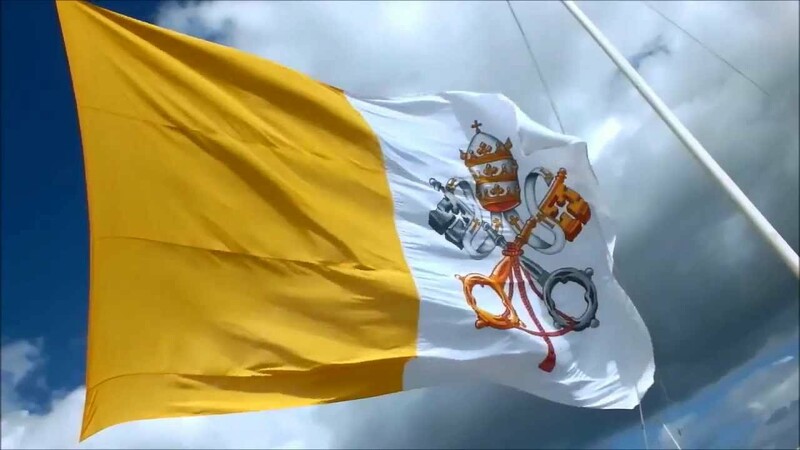 The Papal horn was fittingly that “diverse” horn from the rest of the ten, inasmuch as it was an ecclesiastical authority and not chiefly a political authority. 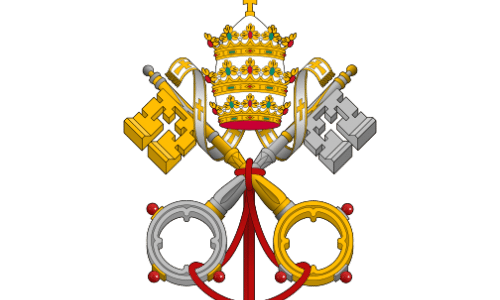 And this “abomination that maketh desolate” through the design and work of the Lateran Treaty has sought to “make desolate” for over 85 years. Now, the object of that abomination has been established and it’s aim reached. On September 25th, 2015, the United Nations held the largest general assembly of governments ever gathered in the history of the world. 198 nations were present there. 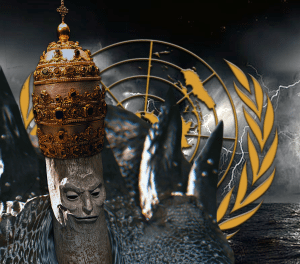 The Vatican, though having close, and often unperceived, ties to the United Nations has been a non-member observer. While the flags of many nations were present, the Vatican flag was absent from among them. That was until the morning of the 25th when the flag was raised officially amongst the rest of the kingdoms of the world. It was a practical declaration that the Vatican was that “diverse horn” from the rest of the kingdoms, and the prophecy of the little horn was true in what followed: it was given a mouth speaking great things. Pope Francis on that very day addressed the delegates of the United Nations Sustainable Development Conference, where each nation, including the Vatican, signed an agreement to unitedly solve what they agree to be the world’s problems across the borders of this agreement in a pseudo-new world order-styled agenda. 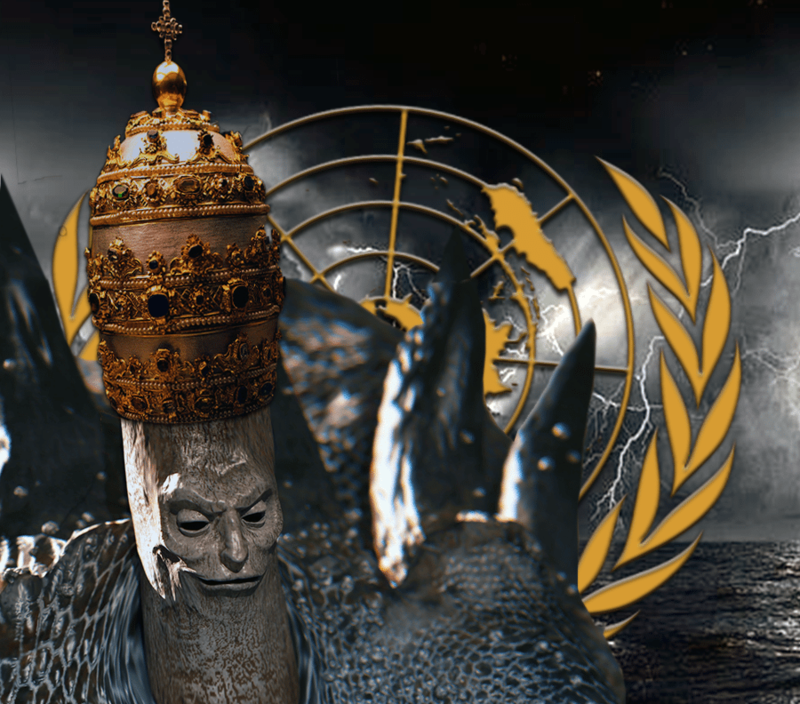 The Papacy has gone from addressing individual nations through diplomatic relations to being received as a kingly voice in the largest governmental assembly ever held. 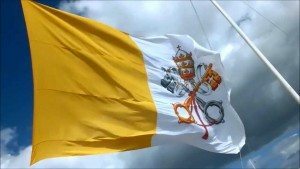 The flag raised should be nothing less than an evident sign of the “arms” that are being influenced to stand on the Papacy’s behalf on the world stage. Truly the “desolation thereof is nigh”, “even at the doors”. John was shown the beginning, and conclusion of, the judgment scene of the great whore during the time of America, but which prophecy finds it’s consummation the ten horns on the dragon’s head. The very abomination of desolation is because of the little horn’s involvement with the kings of the earth, which “make her desolate”, and then shall burn her with fire. This judgment scene beginning is nothing less than the healing of the deadly wound, and the rising again of the little horn power, but did more happen on these judgment signs than what appears? What does the Scripture say regarding the judgment of the little horn? Revelation 18:4-5 And I heard another voice from heaven, saying, Come out of her, my people, that ye be not partakers of her sins, and that ye receive not of her plagues. (5) For her sins have reached unto heaven, and God hath remembered her iniquities. asking permission to copy and send off to friends from my email. Those who do not have facebook that is.